Nipika Mountain Resort near Radium, B.C. Last weekend was girls reunion weekend where some of my friends from my childhood got together to catch up. I had won a free two night stay at the Nipika Mountain Resort last year while at the Calgary Outdoor Adventure Show and this was the perfect reason to use my prize. Upon arriving, we couldn’t believe how beautiful this place was. It is made up of probably about 8 cabins circling a large field and it sports a wood fire hot tub and a little man-made lake fed by a stream , perfect for swimming. There is no formal check in process either. I thought it was weird that we had to pay a month up front, but when you arrive there is a white board that lists the cabins and names the people staying in them. You go to your unlocked cabin and settle in. There is no cell reception and the cabins don’t have phones, so I had to quickly go borrow a satellite phone to call my boyfriend and let him know why I wouldn’t be talking to him during my stay. This resort runs on solar power so there are no appliance besides a fridge. No microwave, no hair dryers or anything. It is the most remote you can get. Perfect for anyone who needs to getaway but can never seem to find the excuse to do so. This Resort is owned by a married couple and their son, Steve helps run the place. As we unloaded the care, we realized that we had forgotten our cooler full of food back home in Lethbridge! And after almost 6 hours of driving we did not want to drive 45 minutes and back to Radium to get food. Steve was a peach and gave us butter, milk, eggs and some steak so we could have dinner and go to Radium in the morning as originally planned. Nipika is surrounded by trails, both for hiking and mountain biking. The resort also has paddocks and they welcome visitors to bring their horses to go on trail rides. They also have a barn that has been converted into a day lodge, making this place the perfect place to have a remote wedding. It is a very short walk from the Kootenay River which was a beautiful shade of aqua (the cameras didn’t catch it) but was moving much to fast for swimming. Saturday morning we had breakfast, sipped coffee on the patio and headed into Radium to the Hot Springs. The drive through Kootenay National Park is just stunning and I wish we had gotten more photos of the road you have to drive through, the red rock cliffs are very cool. You don’t have to pay the daily park fee for Kootenay National Park if you are just using the hot springs. There is plenty of parking and clearly marked signs. Now, here is my problem with Radium Hot Springs- it is really just a swimming pool! They have a cool pool with a diving board and slide for swimming and the hot pool, which is fed by the hot springs. 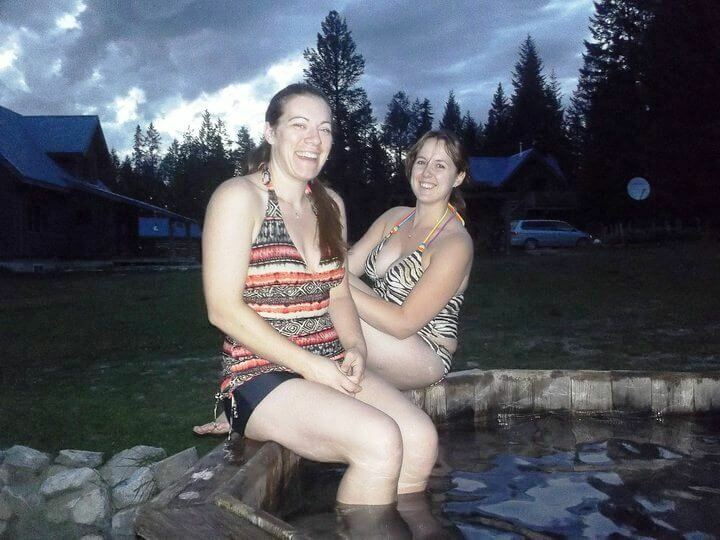 I had been expecting natural hot pools like the one I used to frequent in Baker National Forest in Washington so paying a $6 entry fee and entering a locker room and going into basically a large hot tub wasn’t all that fun. The information guide told us there were natural hot springs about an hour and a half south of Radium around Canal Flats. 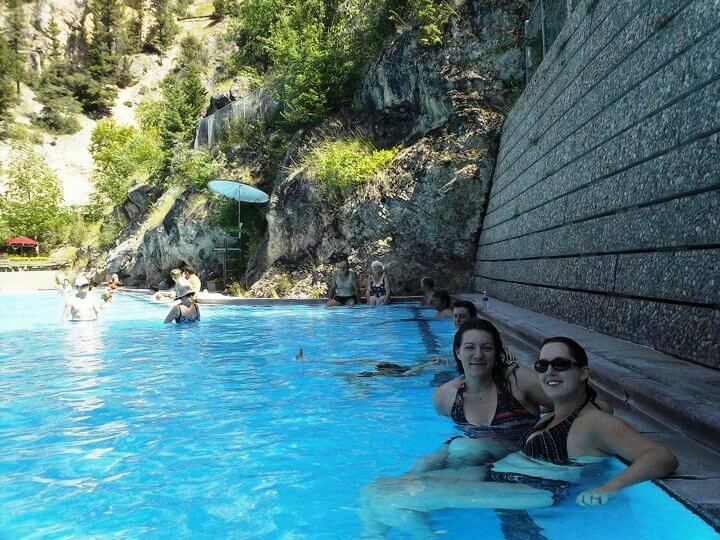 Radium Hot Springs, a LOT different! 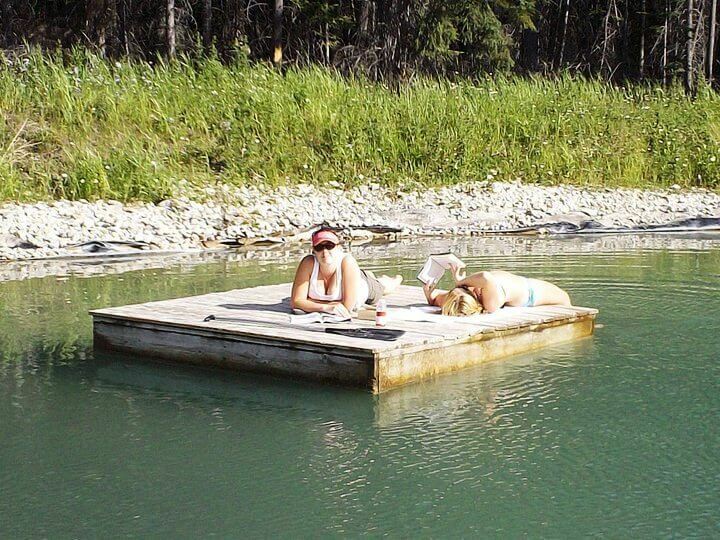 We still really enjoyed the hot springs and decided to continue the relaxation by laying on the floating dock on the little swimming hole at Nipika and reading for hours. That evening we had a fire at the large fire pit in the middle of the field. 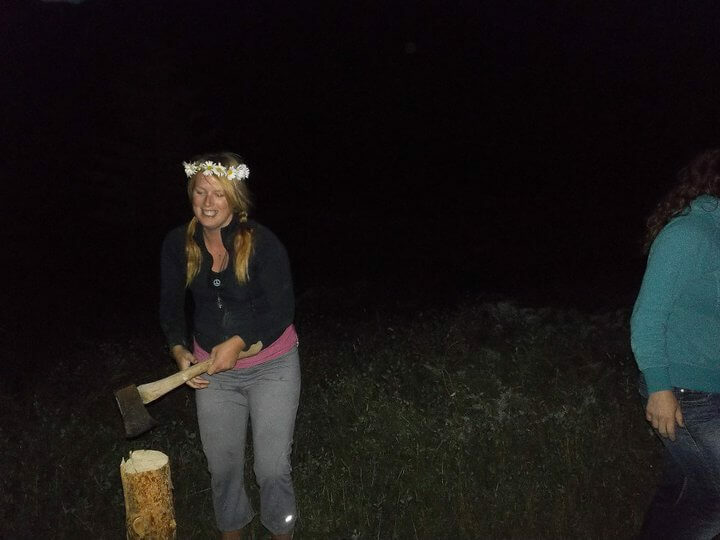 Did I mention that fire wood is included in your stay and piled next to your cabin (which has a wood burning fire-place)? All in all it was an amazing stay! I would recommend staying for more than two nights if you are driving a way though because we didn’t have time to go on any hikes and we didn’t bring bikes which would have been really cool. This is a place you stay for at least 4 nights to a week and soak in your surroundings. I want to come out this winter and try cross-country skiing and snow shoeing.